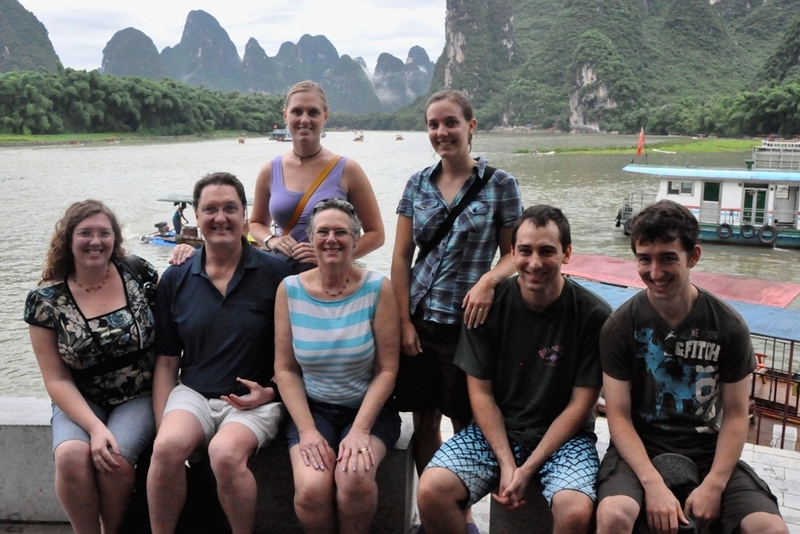 An early flight from Beijng landed our family at Guilin airport before noon. Everyone (except me) was quite impressed to see a sign with my name on it held by a driver at arrivals. 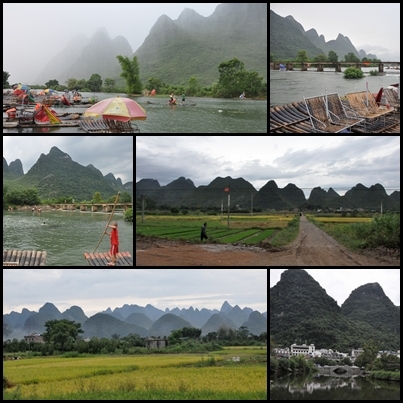 He drove us straight to our hotel in Yangshuo, and the scenery along the way was fantastic. Lots of karsts – layer upon layer of them. The parents had the best suite in the place for our first night, and we had lunch sent up there for us while we played games. We arranged a last minute kayaking trip for the 4 siblings, and they spent two hours paddling down a quiet river seeing water buffalos and small villages and even little caves. The next day was a busy one. We did a cooking class in the morning, eating the fruits of our labours for lunch. The class included a tour of the local market – much more interesting for the others than for me, as I regularly shop in a similar market in Beijing. 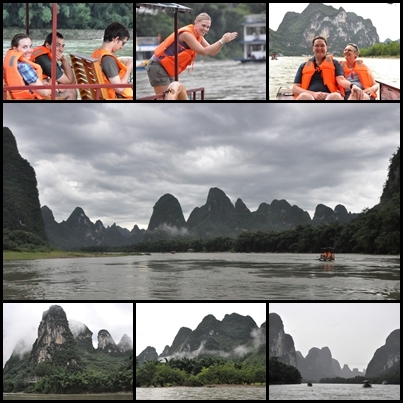 Next we drove up to the most scenic section of the Li River and boated along for 1.5 hours. We drove through a big thunderstorm on the way there, and came across many trees that had fallen down, but the rain abated as we got on the boats. It meant pleasantly cool weather for the boat ride rather than muggy heat, which made me happy, although I think others might have been cold. The scenery along the river was wonderful – huge bamboo stands along the riverside dwarfed the boats we (and others) were in, but then the bamboo stands were dwarfed by the karsts that reared up behind them. At times, wisps of cloud swept along the karsts and it was so beautiful! At the end of the ride imagine my surprise when we ran into a family I know from Langfang! We took a few photos for each other before going our separate ways. Dinner was ready for us at the hotel soon after we arrived and we went straight from dinner to a show – the Impressions light show that uses the river itself for a stage and the karsts behind as a backdrop. 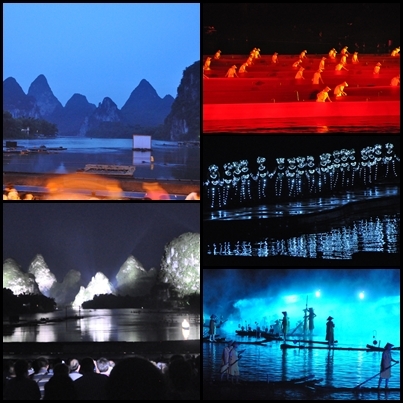 Soon after dark the show began and powerful lights lit up the mountains – amazing! The show was produced by Zhang Yimou, who also did the opening ceremony at the Beijing Olympics. We all enjoyed it. The next morning the kids went rock-climbing, while the parents and I rested. 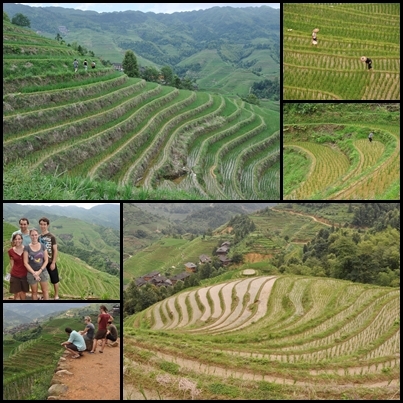 They climbed three routes up a rock face overlooking rice paddies, the base shaded by stands of bamboo. We met with them for lunch then went on a guided bicycle ride. The parents and I stopped with a guide at a swimming spot next to a weir (fun to watch bamboo boats being poled up and down that!) while the kids travelled further with another guide to famous Yulong Bridge – a 400 year old stone bridge. We all got soaked when a thunderstorm blew in. The parents and I were sitting in a small covered raft with table and chairs eating watermelon. The guide and I lowered flaps, protecting us a bit from the rain and wind. It was quite the experience! Upstream the kids were swimming in the rain. It was, all in all, a fun day. We got up early the next morning and left right after breakfast for a long drive back to Guilin and through the mountains to the Longji Rice Terraces. This is an area of about 300km2 where villages have, over centuries, terraced the mountainsides around their villages so as to grow rice all the way from valley to peak. The first terracing efforts began around the year 1300, and most of the current terraces were begun around 600 years ago. There are two main scenic spots around Longsheng – the Ping’an fields (around Ping’an village) and the Jinkeng fields (around Dazhai village). Ping’an is closer to the entrance and has more tourists; Jinkeng is supposed to have better scenery and also has less tourists – so that’s where we went! Our driver took us all the way to the carpark outside Dazhai village. The valley floor itself was pretty, with traditional wooden structures, rice paddies, water wheels, and the like. The hillsides were incredibly green and even from the village you could see terraces everywhere. Mum and I only climbed a short way before turning back, but the others went on a 3 hour hike up to two of the three viewing platforms and back down again. 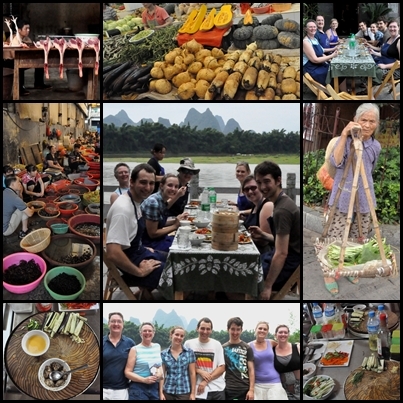 Then it was back to Guilin and a night in a hostel before the kids flew back to Australia.